One of the hardest things to prepare for as a firm that is focused on making and selling this is an audit. The audit could come from your accountants, a client, the government or some other party. Nonetheless, the framework to put together a team and either present the information or to work with exterior parties to facilitate their work does not exist in most firms because it isn’t an expected business need. The Audit Preparation Checklist is a sophisticated tool that is designed to be used with Microsoft Project. It can be downloaded for free from this page and is easy to customize. If you are responsible for responding to audits in your firm, having the Audit Preparation Checklist template around can be a big help. Open the template in Microsoft Project and review the steps in the checklist carefully before making changes to the actual steps in the checklist to better reflect the specific audit steps that your firm will need to accomplish. Distribute the template file to the company and audit team members by placing it on a central server and making it available for collaboration efforts. Encourage the audit team and the company to stay on top of updates to the checklist. You can use a sharepoint server inside your firm to share data. If the audit team is located outside the company, you might consider granting them access to a VPN that allows them access to the audit preparation checklist or posting the document in the cloud and setting permissions if your company allows that. 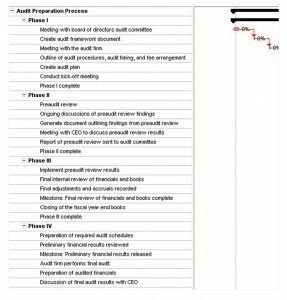 If the audit process is formal and external, you can keep track of the audit team’s progress via the published information from the audit preparation checklist. When the audit is complete, if there are questions about the actual audit, the audit preparation checklist can be used as a record that will verify the processes that were followed.